This page describes the tabs, menus, and buttons in the Anaconda Navigator window. The tabs in the left column represent the main components in Navigator. Click a tab to open it. To learn more about terms used in Anaconda, see the Glossary. Normally Navigator is used online, so that it can download and install packages. In online mode, Navigator must be able to reach these sites, so they may need to be whitelisted in your network’s firewall settings. Some of the functionality of Anaconda Navigator will be limited. Conda environment creation will be subject to the packages currently available on your package cache. Offline mode is indicated to the left of the login/logout button on the top right corner of the main application window. Offline mode will be disabled automatically when internet connectivity is restored. In the Preferences dialog, select “Enable offline mode” to enter offline mode even if internet access is available. Using Navigator in offline mode is equivalent to using the command line conda commands create, install, remove, and update with the flag --offline so that conda does not connect to the internet. The Home tab, shown in the image above, displays all of the available applications that you can manage with Navigator. You can also build your own Navigator applications. Launch the application–Click its Launch button. Install an application–Click its Install button. Update, remove, or install a specific version of an application–Click the gear icon in the top right corner of the application box. Applications are installed in the active environment, which is displayed in the “Applications on” list. To install an application in a specific environment, first select the environment in the list, then click the application’s Install button. You can also create a new environment on the Environments tab, then return to the Home tab to install packages in the new environment. Some applications require licenses. To see the status of all licensed applications and add new licenses, on the Help menu, select License Manager. For more information, see Managing application licenses. The Environments tab allows you to manage installed environments, packages and channels. The left column lists your environments. Click an environment to activate it. With Navigator, like with conda, you can create, export, list, remove and update environments that have different versions of Python and/or packages installed. Switching or moving between environments is called activating the environment. Only one environment is active at any point in time. For more information, see Managing environments. The right column lists packages in the current environment. The default view is Installed packages. To change which packages are displayed, click the arrow next to the list, then select Not Installed, Upgradeable or All packages. For more information, see Managing packages. Channels are locations where Navigator or conda looks for packages. Click the Channels button to open the Channels Manager. For more information, see Managing channels. On the Learning tab you can learn more about Navigator, the Anaconda platform and open data science. Click the Webinars, Documentation, Video, or Training buttons, then click any item to open it in a browser window. On the Community tab you can learn more about events, free support forums and social networking relating to Navigator. Click the Events, Forum or Social buttons, then click any item to open it in a browser window. To get help with Anaconda and Navigator from the community, join the Anaconda forum. 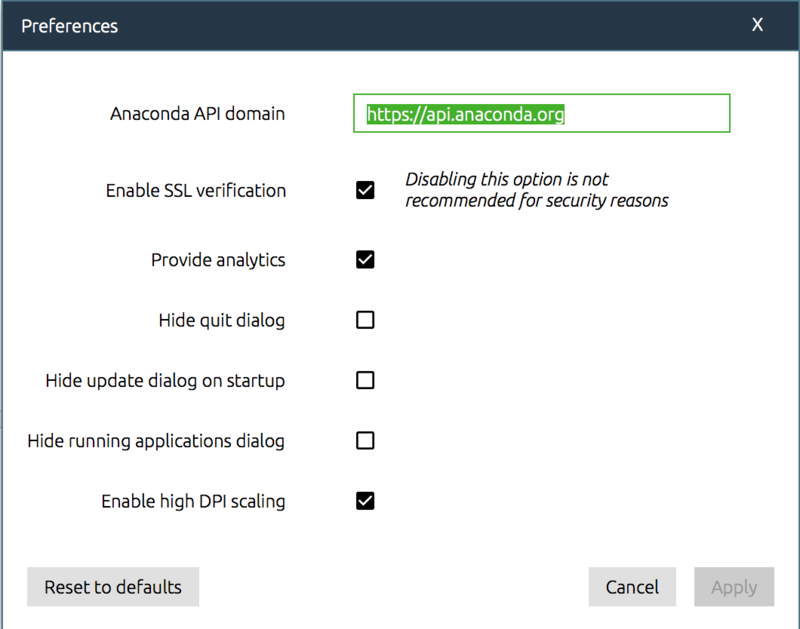 Reset the Anaconda API domain to point to a local Anaconda repository instead of Anaconda Cloud. Toggle the option to provide personally non-identifiable information to help improve the product. Hide the Quit dialog box when exiting the program. Hide the Update dialog box when starting the program. Hide the Close running applications dialog, which normally displays when exiting the program if there are still running applications that were launched from Navigator. Modify Navigator’s display with Enable High DPI scaling option. This option can be useful if Navigator isn’t displaying correctly on some high DPI screens. Click the Reset to defaults button to change preferences back to their default values. Services (macOS only)–links to your computer’s system preferences menu. Hide Anaconda Navigator (macOS only)–hides the Navigator window. Hide Others (macOS only)–hides all windows except the Navigator window. Show All (macOS only)–shows all windows including the Navigator window. Search–links to your computer’s Help (Windows and macOS only). Online Documentation–links to this documentation, which you can read in any web browser. You can also open the documentation by clicking the Documentation button at the bottom left of the Navigator window. License manager–allows you to add and remove licenses, and view details of licensed packages. For more information, see Managing application licenses. Logs viewer–allows you to review the logs of all actions performed in Navigator in the current session. This option displays a list of log files, including navigator.log, which contains Navigator application logs, and condamanager.log, which contains logs written by the conda-manager component. A new log file is created every time you run Navigator, with a sequential number appended to the file name. More recent log files have higher numbers. Documentation–displayed at the bottom left. Click to open Navigator documentation in a browser. Developer Blog–displayed at the bottom left. Click to read what our developers have to say about Navigator development. Feedback–displayed at the bottom left. Click to send us feedback about Navigator and help us make it better.